Who is it for? 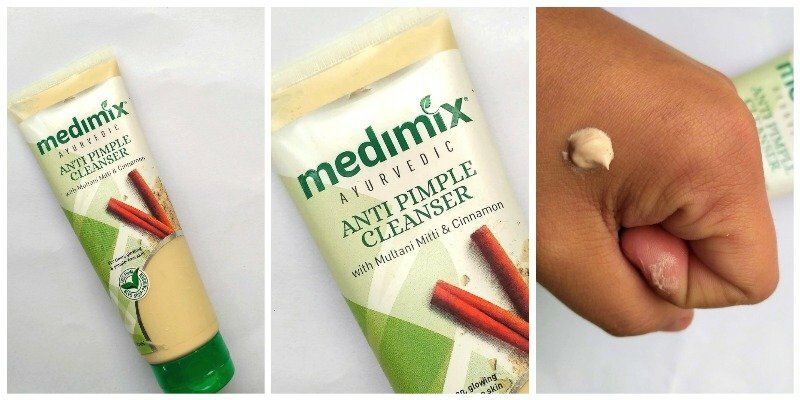 Medimix Anti Pimple Cleanser is for all those looking for a good cleanser which removes dirt and clears acne and also gives brighter and softer skin. Take sufficient quantity and massage gently with fingertips avoiding the eye area and let it dry. Wash thoroughly with water and pat dry. It has a good cleansing action as it gives softer and brighter face after use. It contains Multani mitti which is known to give clear skin and also contains cinnamon which is believed to treat acne.it did not really work on my acne so, that was a bit disappointing for me. It does give a little burning sensation to the skin when kept for drying. One should avoid using if the burning sensation continues. It has a moderate fragrance which is not too bad or too good. It comes in a transparent tube which has the brand name printed on it. The lock is tight and hence, leak proof which makes it travel-friendly as well. It has a muddy color signifying the Multani mitti in it. it has a very thick consistency just like a paste or a face pack. I would like to recommend this face wash to those who are looking for a good cleanser which brightens up the skin and contains an ayurvedic formula. This one is not for girls with sensitive skin as it might give burning sensation. nice article with good information about the cleanser. thanks for sharing such useful information.